“No matter how much you search, I bet I am the only humanoid designer you will find in Korea” Professor Eum Younseal said jokingly. At present, humanoid design is not a very developed field, so the number of humanoid designers in Korea is small. However, Professor Eum Younseal is confident that the field will soon expand, for humanoids will inevitably constitute the biggest part of the robot industry. SMT spoke with the creator of the humanoid Diana, which is the turning point of not only her life, but also in the library industry. 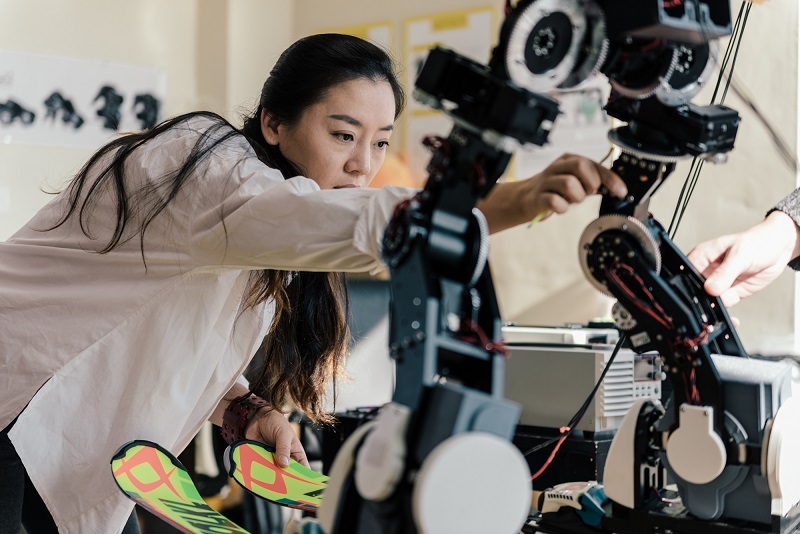 Since the field ‘robot design’ is relatively unknown among the public compared to ‘robot engineering’, would you briefly tell us about difference between those two fields? Robot designing involves ensuring harmony with its surroundings and people’s lives. Actually, it is true that robotics software receives more attention in the robot industry. Artificial Intelligence (AI) is also receiving spotlight causing a stir, especially after the AlphaGo sensation. However, I firmly believe that as robots progress, they will naturally become part of our daily lives, so robot design will be a core factor for consumers when they make a purchase. In reality, regardless of a product’s quality, specifications, and capacity, it must be attractive enough to warrant purchase. Not only does design improve a product’s look, but it also makes it easier for purchasers to use. For that reason, as robots become more and more a part of our lives, the importance of design increases. Where do you get your inspirations for your robot designs? Honestly, I get a lot of my ideas from movies, cartoons, and novels. Art and technology actually develop and improve together. Whenever technology takes a step forward, art follows suit. Technicians are inspired from things they’ve seen in movies or cartoons and gain great desire to bring what they’ve seen to life. The invisible cape from the Harry Potter series is an exemplary illustration that became a reality a few years ago. Witnessing cases like these, artists continue to imagine the impossible and technicians continue to make them a reality. Personally, “I, Robot (2004)” has had a profound effect on my robot designs. Like the robot in Terminator, all prior robot designs were made of iron and had similar skeleton structures, like ‘chunks’ of metal. However, the idea of sleek robots in “I, Robot”, robots became slenderer and closer to humanity. The NS5 was the robot inspired me to design Charlie in 2009 and Charlie II in 2011. You majored in craft, and most people think of ‘craft’ as ‘handicraft’ in the field of fi ne arts. What made you spread out from this into robot design? That is, what inspired you to make sure a bold career decision? Everything was coincidence. While my husband and I waited overseas admissions to study abroad, my husband spent most of his time working part-time at a robot company. I was free at the time, so I used to visit him often. One day, as I watched him working on a robot project, its design seemed necessary to change for better looks. So I reached for some Styrofoams and sculpted it into what I thought. The head I’d carved somehow made it to the eyes of the company’s CEO. Impressed, he immediately offered me a part-time job with the company’s design team. Work did not feel like work when I was there. Every day was exciting. I simply loved doing what I was doing. As my weight of love on handling robots firsthand, metal creations would not satisfy me. That is when my advisor recommended I consider ‘kinetic art’. Kinetic art was exactly what I was looking for. It deals with both material and movement, two components I had great interest in. How did you feel introducing Diana to the world, and how did you feel after receiving the medal? Diana is a humanoid robot that began as a governmental project initiated by the Ministry of Commerce, Industry and Energy. The entire process was interesting. It was very challenging to incorporate design, software, AI, and design all together. At the time, there were few opportunities offered to me to design humanoid robots, so it was great opportunity. Since I wanted to showcase myself and my talent, I participated enthusiastically. Once the robot was finally complete, I felt proud. The robot felt like my own flesh and blood. I am a bit disheartened that we didn’t receive top prize for autonomous driving as the team worked so hard, especially in that aspect. Still, the robot’s skiing speed was impressive went out before artificial intelligence thought. We thought about slowing down the robot’s speed, but it had to arrive at the finish line at a certain time, so that was not possible. If we had slowed its speed, we could have earned gold for autonomous driving. Nevertheless, I’m grateful to have received silver for remote control. You surely came across problems during the design phase of robots. How did you overcome them? People usually view robot designers as being good at computer systems, but that not necessarily true. Sometimes I’m asked to do coding, but I can't do it. I can only operate 3D design tools. Therefore, I hire an assistant who is good at it, such as an assistant who majored in computer programming. Not all people are good at everything. It's only natural for people to have weaknesses. That doesn't mean the person is incompetent. They are just good at other things. That's why I work with others who know how to handle computer tools. Collaboration is really important. It is similar to that of a ship. There is an order from the captain, and then the order is carried out by the crew on board. Do you have any values or mottos you live by? Please tell us what they are and what they mean. To be honest, I’ve not that really thought about that. But if I were to ask myself what kind of person I am, I’d have to say a ‘fun’ seeker. If I don't like something, I never do it. But if I like something, I put every effort into it. Fortunately, my interests and talent coincide. It may seem coincidental, but I believe when the door was knocked, I could opened it because I knew exactly what kind of fun awaited me. One thing I want to tell students is to do things they like and enjoy, even if it means or causes failure. For example, imagine you work hard for three years in a certain field and you fail to obtain success. Do you think really you failed? Did you just waste three years? No, I don’t believe so. You’ve gained valuable experience over those three years. There is plenty of time for more fun in life. It was not a failure. I’m sure you learnt something from those three years. You only live once, so it is important to find and do what you are interested in. Is there another area you would one day like to challenge? Please tell us about your future plans. 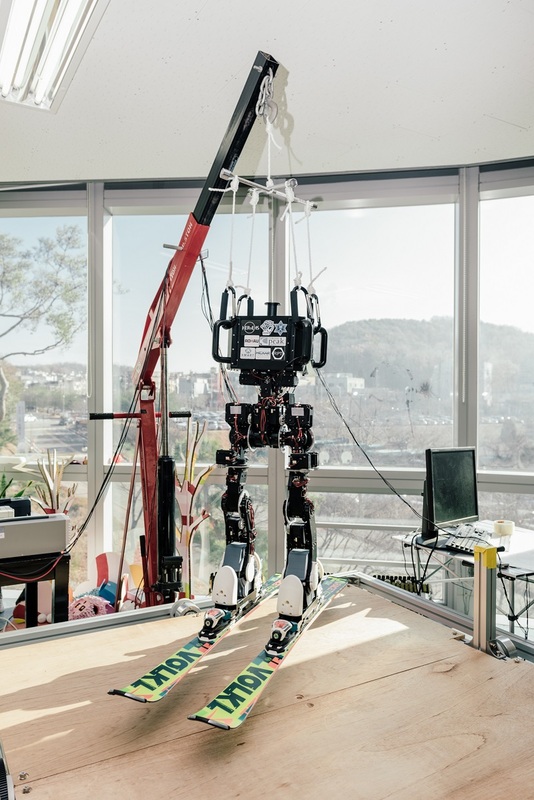 I’m interested in an hosting an exhibition of performing robots. Normally, when people ask about performing robots, they are thinking about mechanical dances. However, that’s been done; that’s a decade old platform. It’s time for a change. I’m currently working on a performance that connects robots and humans directly. In the performance I already held, I allowed five people at a time to move together in unison with the robots. The scale was 1:1. The performance preparation team arranged for audience to be paired with a robot to solve in various missions that were based on a storyline, a scenario we created for them. The audience enjoyed the performance because they were part of it, working together with a robot. I hope to continue to develop such performance arts, and eventually to start up my own company. There is a lot of emphasis on fusion talent nowadays. Sookmyung Women’s University is also on board with the new direction. How do you feel about the new direction? I think Sookmyung Women’s University made an excellent decision. Just like my performance exhibition case, fusing talent allows a great deal of people from all walks of life to come together to create something. Working separately, nothing gets combined, so someone has to look at things from the big picture and from various viewpoints. That person is the key to pulling the entire thing together and making it work. This is ‘fusion’ talent. 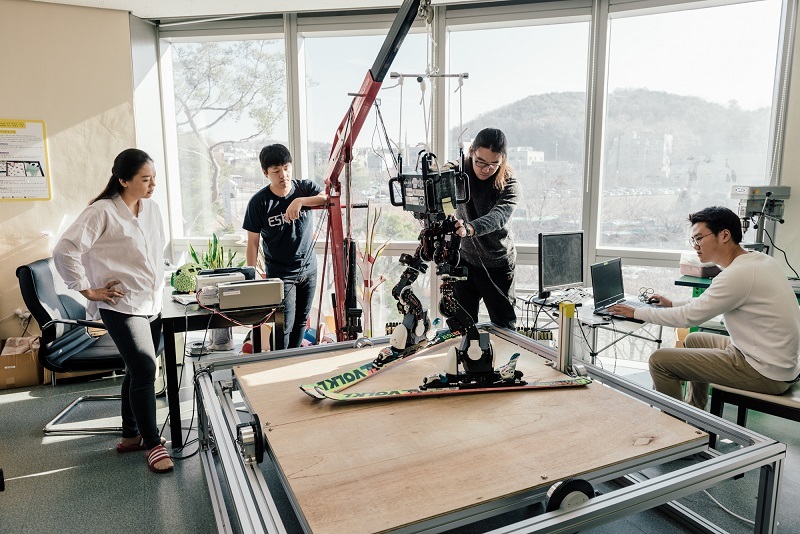 At Sookmyung Women’s University, students usually dig deep into their major, but the future needs people who can break partitions between seemingly unrelated majors. These persons are the talent leaders the future needs. Take a lesson which seems unfamiliar with each other. Though you don’t know well about something or may even get poor grades in a course, I recommend taking advantage of your time at university to try something new. This is the basic goal of university; have experiences. Focusing solely on job-seeking might indeed result in a job, but is it one you like or enjoy? For your long-term future, look to the possibilities is needed. Lastly, before the time of the upcoming change, would you please leave a final word of advice for Sookmyugians? Have an open mind. Whenever problems occur, most people only look at solutions from one perspective. I recommend approaching issues from different perspectives. You’ll find endless possible solutions. To do this, be open-minded. Only people who can see problems from the big picture will have the skills to lead society. Avoid stereotypes. I hope that Sookmyungians are never called typical. Be proud to hear the word atypical used to describe you. To think and imagine differently is what we need in any field.